1) The darling buds of may or second by Rough winds in-- May. 2) The winds that blow in summer in Shakespeare's Sonnet 18 are-- rough. 4)' Thou art more lovely and more temperate' - - - here the word' thou' refers to-- the poet's friend. 5) 'But thy eternal summer shall not fade' - - the word opposite in meaning to' eternal' is--Temporal. 6) Rough winds shake the--Buds. 7) The sun's complexion in Shakespeare's Sonnet is said to be-- golden. 8) The poet's friend is compared to-- a summer's day. 9) 'So long lives this' - 'this' refers to-- poet's verse. 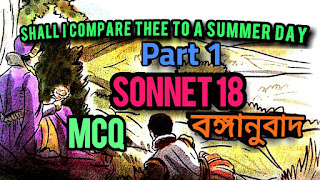 10) In Sonnet 18 summer is described as-- changeable. 11)'The darling buds of May' are shaken by - - rough winds. 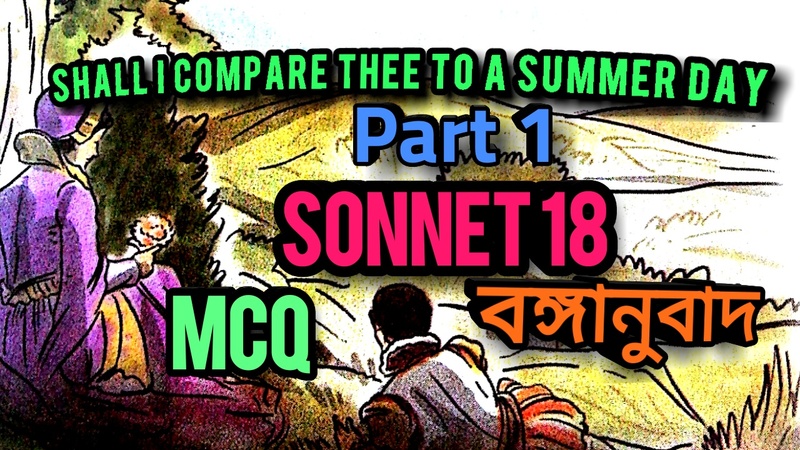 12) The 'Sonnet 18' is-- sonnet . 13) The beauty of the poet's friend surpasses the beauty of-- Summer. 14) The month referred to in' Sonnet number 18'is - - May. 15) Death shall not be able to take the poet's friend into his--Shade. 16) The gold complexion of the sun is dimmed by-- clouds. 17) In the poem Sonnet no 18 Sun and death have been imagined as - - males.